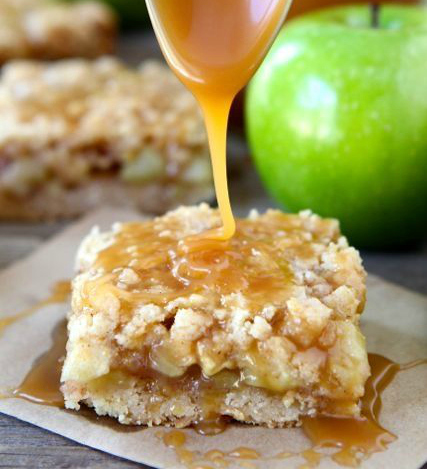 Salted Caramel Apple Squares Recipe. How to Cook? One of the many benefits of having a son who works at an organic farmers market is getting a few bruised but lovely fruits and veggies at the end of the day! Jack brought home some granny smith apples yesterday and the first thing that came to mind was whipping up a yummy apple dessert. I love apples, cinnamon, caramel and anything with crumbs so this apple square was the perfect choice. (Thank you twopeasandtheirpod) for the image) Unfortunately, my photo did not come out as gorgeous! Heat the sugar over medium high-heat in the bottom of a heavy 2-3 quart saucepan. When the sugar starts to melt, start whisking the sugar. When the sugar is melted, stop whisking. Continue cooking the sugar until it reaches a deep amber color. Make sure you watch the pan very closely. This is where it is easy to burn the caramel. You want the caramel to reach 350 degrees F. Keep an eye on the temp. As soon as the sugar reaches the dark amber color, carefully add the butter. Whisk until butter is melted. Remove the pan from the heat and carefully pour in the heavy cream. Whisk until cream is incorporated and caramel is smooth. Whisk in the salt. Place the pan of caramel sauce on top of a bowl filled with ice. Whisk occasionally while you are prepping the rest of the bars. This will allow the caramel to cool and thicken. Preheat the oven to 375 degrees F. Spray a 9×13-inch baking pan with cooking spray and set aside. Place the diced apples in a large bowl and sprinkle with lemon juice. Mix gently. In a separate bowl whisk together flour, cornstarch, sugar, salt, cinnamon, nutmeg, and ground all-spice. Pour over the apples and carefully combine. Set aside. In a large bowl whisk together the flour, sugar, baking powder, salt, and cinnamon. Cut in the butter using your hands, until butter is mixed in, but you still have small chunks of butter. Mix the egg and vanilla together. Add into the flour and butter mixture and combine. The dough will be crumbly. Pat half of the dough into the prepared pan. Spread the apple mixture evenly over the bottom crust. Drizzle about salted caramel sauce over the apple filling, about 1/2 of it. Crumble the remaining dough over the apple caramel layer and pat gently. Bake for 35-45 minutes, or until the top is golden brown. Cool completely on a wire rack. Cut into squares. Drizzle salted caramel sauce over the squares and serve. You may not use all of the salted caramel sauce for this recipe. Store the leftover sauce in the refrigerator for up to 2 weeks.